Nobody likes the cold. Well, at least nobody who wants to be outside, enjoying nature, on a motorcycle. Maybe some of you do, I suppose, but you are crazy! So we have a choice: pack it in for the winter or gear up to stay warm. I’ll take option #2, please! 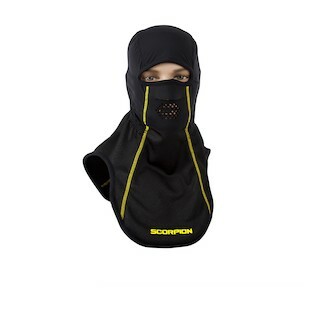 The Scorpion Baltic Balaclava is here to help us lengthen our riding season. Plain and simple. Constructed of warm, breathable, anti-bacterial fleece, pull this on when the weather goes south and keep on riding. An extended Airguard windproof neck and chin curtain work to keep… well… wind from going down your jacket, which if not done, can result in you becoming quite cold very quick. Additional features, such as a Neoprene mouth and nose area and elastic side panels, help with fit and breath ventilation. So don’t let the cool and downright cold months of a northern winter keep you from enjoying your time on two wheels. When things get cold, rock the Baltic Balaclava and stay warmer throughout.